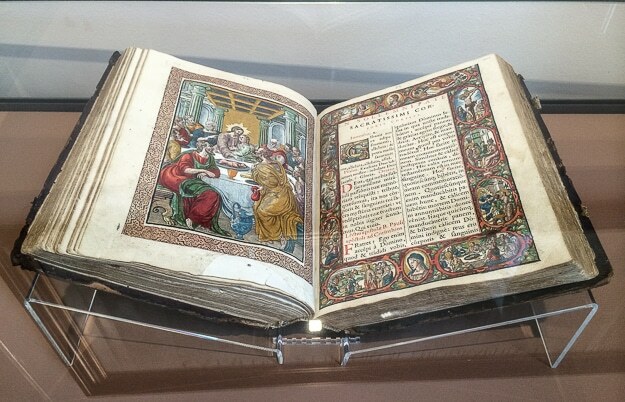 A Roman Missal printed by Jan Moretus in 1613, now displayed in the Plantin Moretus Museum. The missal contains two illustrations by Peter Paul Rubens. The Plantin-Moretus Museum in Antwerp, Belgium holds a distinction. It’s the only museum in the world that is a Unesco World Heritage site. Of course it didn’t start out as a museum–not that being a museum is a bad thing. But, perhaps of all the hundred or so Unesco World Heritage sites we’ve been to, the Plantin-Moretus house and shop was, like so many other Unesco sites, a place where people lived and worked and achieved extraordinary things that affected the entire world that came after. But, and I may be prejudiced by my career as a publisher, the Plantin Moretus Museum is in the running as the most important historical site in Europe. Because Christophe Plantin and his son-in-law Jan Moretus were printers and publishers. And, while Johannes Gutenberg may have invented modern printing, Plantin and Moretus perfected it and caused the words they printed to spread all over the world. That’s world changing stuff, and far more important than one more ornate cathedral. I’m not going to write an essay here about the post Reformation merchant culture of Northern Europe, and how the comparatively secular nature of the Protestant north led to a society we’re more likely to recognize as a modern meritocracy. But I will opine that the cities of the north, such as Antwerp, Amsterdam, Bremen, and Bruges, that grew up around a city hall and merchant guild houses rather than a cathedral, were far more instrumental in spreading knowledge and trade and a notion of the equality of man than a church that was very interested in perpetuating a hierarchy of thought that had it at the top. Anyway, enough preaching, and on to pure admiration for Plantin and Moretus. The Plantin Moretus Museum is tucked away in Antwerp a good walk from the train station. But since we came to Antwerp primarily to see Plantin Moretus, it was a walk we gladly made, even in the light spring rain. 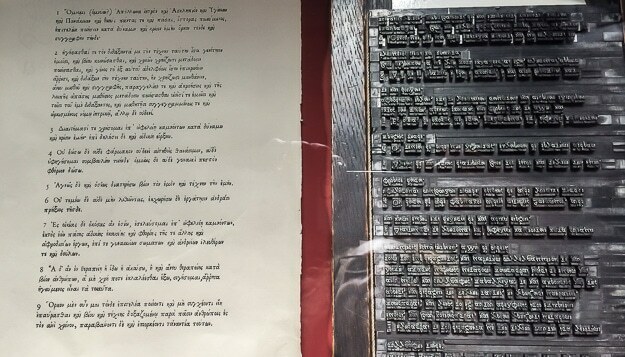 A text in Greek, and the metal type that printed it. You can see Kris’s reflection in the glass. From the outside, the building is nothing special. It looks, more or less, like any other building of that vintage in Antwerp. It’s not exactly austere from the outside. The facade speaks of money, but in that northern European style of reserved taste rather than ornate ostentation. Plain, in the best sense of that word. It’s the inside that holds the treasures–the books and decorative prints, and the machines who made them. And, by extension, the air of the art, craft, and imagination of the men who created such wonderful machines. There are amazing and priceless artifacts here: the two oldest printing presses in the world, a Gutenberg Bible, a five language Bible, with commentary, printed by Plantin and Moretus at the behest of the Spanish King, Felipe II, portraits of the family painted by Peter Paul Rubens, illuminated texts from the 11th Century, and an illustrated volume of Ovid’s Metamorphoses printed in 1474. But what interested me even more, were the tools and methods of this early printing. There were endless cabinets of type of all faces and sizes. Plantin Moretus houses the original dies and matrices of Claude Garamond. And you type freaks know all about the Garamond typeface. There are, as I said, countless examples of the 15th Century printer’s craft. Presses, to be sure, but the tools used to cut type, the boards where type was set by hand, the wedges used to justify type into neat columns, and the fantastically accurate frame and pin system used to register etched plates used to print multiple colors on one page. If you’ve ever seen a color photograph printed out of register in your newspaper, you have to wonder how Plantin and Moretus could turn out such incredible work over 500 years ago and they can’t get it right today. Another missal, this one printed by Christophe Plantin in 1572. Obviously, there’s a lot of history here, contained not only in the wonderfully preserved remnants of the techniques of printing, but also in the books they chose to publish. There were, of course, piles of religious works such as the Bible and the writing of theologians such as Augustine and Aquinas, but Plantin and Moretus were also instrumental in publishing–and keeping alive–classical works such as those of Ovid and Horace. But arguably most important were the scientific works they published, including detailed anatomy texts printed at a time when publishing such things could get you in trouble with the church. 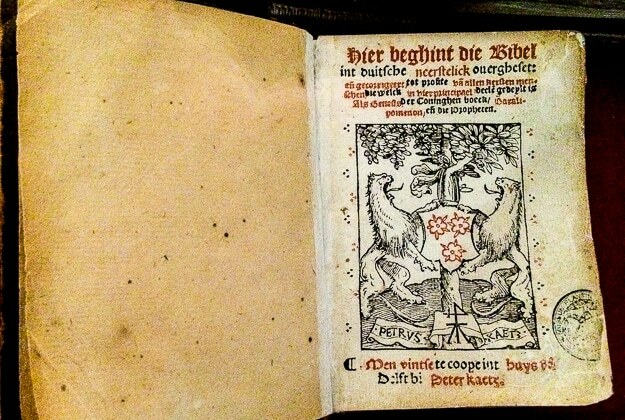 This Bible, with Lutheran annotations, was published in Antwerp in Hans van Roermond in 1525. He got his head cut off for his trouble. 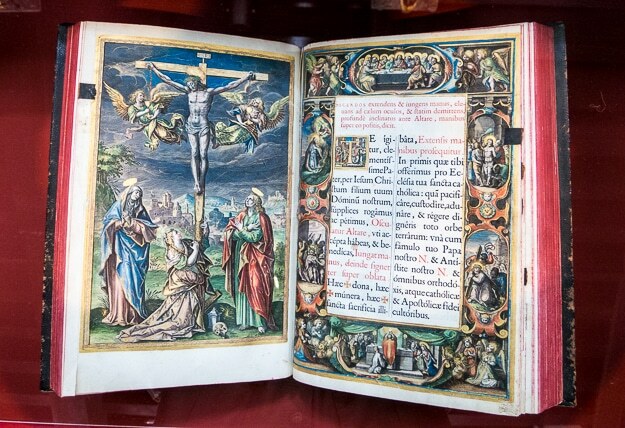 Speaking of trouble with the church, in the museum, there are also texts printed in Antwerp, including a Lutheran Bible, that got its printer beheaded for heresy. I’ve been meaning to write this post for a long time. Since about last April when we visited Plantin Moretus, in fact. To be honest, we wouldn’t even have known about this marvelous museum if we hadn’t run into a man named Neil Shaver, who was a friend of my father, and a member of the informal symposium known as the Crawdad Room Regulars. The Regulars were an ever changing group of interested men from my hometown of Council Bluffs, Iowa who would meet almost every day for morning coffee and work out the bigger questions of the world. I’d been invited on a few occasions to join my father at the Crawdad Room–which changed locations several times over the years–and so had got to know Neil. Neil is a fascinating guy who owned some grocery stores in Council Bluffs, but after retiring, devoted himself to the craft of fine book printing. He published several books under his Yellow Barn Press imprint and he was the one who told me about Plantin Moretus. Thanks a lot, Neil. You were right. It was one of the best places I’ve ever been. Interesting post. Its nice to discover such good things found in an unexpected way. Thanks for sharing! There’s a lot to Antwerp and next time we’ll spend some more time there, but pound for pound this is hard to beat. What an interesting museum! As writers, the old printing presses would be a sight to see :-). You can even see a video of how they operated. Fascinating. Like I said, unless you’re a real book and printing geek like we are, it may not be for you. But we found it fascinating. You can easily do it in a couple of hours, then go have some Belgian beer, or do like we did, and just hop the train for Amsterdam.